** The priority application deadline for IIPE 2015 was April 15. We will continue to take applications through early May and will review them on a rolling basis. Acceptance of applications after April 15 will be on a first-come, first-served basis and dependent upon available participation spots. *As our scholarship fund is limited, we are no longer accepting scholarship applications at this time. The International Institute on Peace Education (IIPE) is an applied peace education laboratory that provides a space for pedagogical experimentation; cooperative, deep inquiry into shared issues; and advancing theoretical, practical and pedagogical applications. For 32 years, the IIPE has brought together educators, academics, professional workers, and activists in the field of peace education from around the world to exchange knowledge and experiences, and to learn with and from each other in an intensive weeklong residential learning community. IIPE 2015 will be hosted by The University of Toledo in Toledo, Ohio from July 26-August 2, 2015. 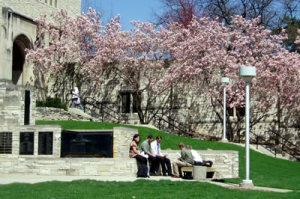 This year’s Institute will also celebrate IIPE’s new institutional home at The University of Toledo. Peace education has an important role to play in addressing issues of urban decline and the interconnected dilemmas of poverty, violence, health, and environmental degradation in an era of unprecedented economic globalization. The IIPE provides a constructive process model and interactive space through which these issues will be explored and for the identification and development of strategies and methods to address them. 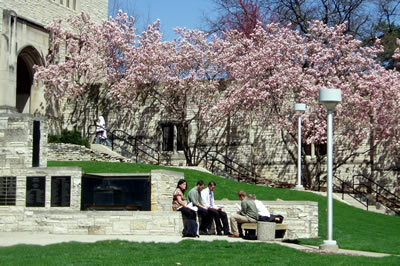 Students studying on The University of Toledo campus. Addressing the decline of urban environments and the associated and resulting forms of injustice and violence requires a holistic and comprehensive strategy. The causes of such decline range from the local to the global. The negative effects of globalized economies on local communities are well documented. In its relentless expansion, the global economy gobbles up finite natural resources at an unsustainable pace and threatens cultural and political diversity. Economic policies predominantly favor the interests of wealthy countries over those that are less developed (LDCs). The exploitation inherent in economic globalization pertains to not only LDCs but to segments of developed countries as well: the US cities of Detroit and Toledo are examples, wherein economic globalization has produced profound injustice. Both the economy and the injustice are global in the sense that they transcend national boundaries. Both economic prosperity and economic injustice, along with their concomitant forms of social injustice, are no longer distributed in national terms but are distributed in global-local terms—in terms of global winners and losers, regardless and independent of national location. A response to this global economic structure requires a reconceptualization of the scope of social and political distributive justice toward a global, transnational conception. It also requires the development of forms of political and civic education that cultivate the political efficacy of, and thereby empower, current and future citizens to politically engage in the pursuit of justice within and counter to this new economic reality. 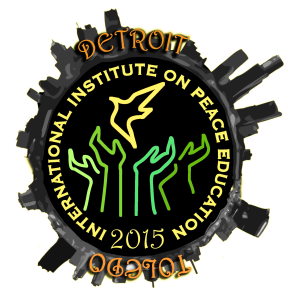 Peace education, as developed through the IIPE global network of educators, provides a framework and transformative pedagogical practices for consciousness-raising and social and political engagement. 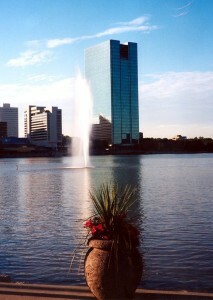 The University of Toledo is uniquely situated at the crossroads of the Midwestern United States where many large cities have been significantly impacted by economic depression. Detroit, one hour north of Toledo, has one of the highest unemployment rates in the nation at 16.4% (June 2014, US Bureau of Labor Statistics) and in 2013 had one of the highest violent crime rates at 2,123 per 100,000 residents (2013, FBI Crime Statistics). IIPE 2015 offers a significant opportunity to impact the region through involvement of local educators and community organizers. Specific site visits will be coordinated to meet and learn from both regional community development and education programs that have been successful in lifting up local populations. While IIPE will delve into Toledo, Detroit and other “Rust Belt” issues and responses, participants are invited to bring examples, inquiries, and educational projects that will illuminate the global-local and cross-regional connections. Efforts will be made to assure that inquiries and outcomes are adaptable to multiple international contexts. The weeklong programming will include presentations, workshops, and programming drawn from participants’ proposals as well as local community contributions, and intra-IIPE dialogues. At the conclusion of the IIPE, all participants will have the opportunity to contribute to a special issue of In Factis Pax, an online journal of peace and social justice based at The University of Toledo. This issue will feature theoretical and practical applications of peace education for urban renewal toward social and ecological justice as gleaned from the 2015 IIPE. In Factis Pax is freely available to educators, peace builders, and community change agents from around the globe. The IIPE was founded in 1982 by Betty Reardon and colleagues at Teachers College, Columbia University. Nominated for the Nobel Peace Prize in 2013, Betty Reardon is well recognized as a founder of the field of peace education. While the IIPE is an annual gathering, this is the first time that it has addressed the issue of urban renewal. This is also the first time the IIPE has been hosted in the domestic United States since 1995. Participation fees for IIPE 2015 are $550 USD. Participation fees cover all onsite expenses including meals, lodging (double occupancy dormitory with air conditioning), local transportation and airport shuttles (if required).